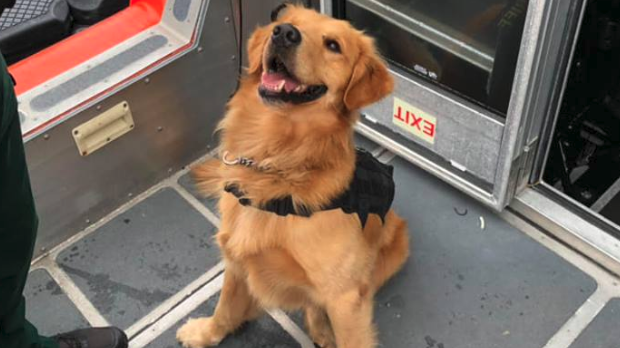 A drug-sniffing police dog in Florida overdosed after identifying more than a dozen people trying to board a boat party with illegal substances. K-9 Jake had to be treated with anti-overdose medication Narcan after exhibiting symptoms of a drug overdose, the Brevard County Sheriff’s office said. incident of some sort,” a spokesman said. Analysis suggested the dog had ingested a form of ecstasy. The party-goer believed to be responsible, a 33-year-old, had hidden pills in his boxers which later tested positive for ecstasy and amphetamine. Jake is in a stable condition and is expected to make a full recovery.